As any good gamer knows, there's a point where one type of game can get saturated on the market. Currently, everyone and their brother (and their brothers!) has a deck building game. Dominion launched a craze, and everyone is getting in on the fun. While most are fun, quantity doesn't always equate to quality. In the midst of a flood of similarity, there comes a point where something surfaces. It comes in the door, quietly, cleverly and is simple but refined. It goes unoticed by the masses, but it soon rises to the top ,captures people's attention as unique and differentiated and breaks the mold for the genre it is in. I'm happy to say, that in the world of Deck Builders, Fantastiqa not only does this, but does it like nothing ever has before! Fantastiqa is aptly named, as it's fantastic! Normally I hold my opinions to the end of a review, but there really is no other way to start this. If you have never seen or heard of Fantastiqa, you are in for a ride! If you have, you know what I'm talking about! 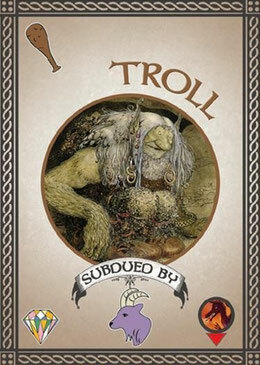 Fantastiqa is billed as a "Deck Building Board Game of Adventure for 2-4 players" and adventurous it is! While most deck building games follow a simple pattern of start siple, gain more cards, delete the starting cards from your deck, and win by victory points, Fantastiqa and it's designer, Alf Seegert, threw all that out and decided to do something, well, fantastic! Fantastiqa starts familiar. You get a deck of cards that provide resources. However, in this game, it's not one or two resources... no, in this game, you'll have Fire, Webs, Bats, Cats (yes, Cats), Spatulas (Yeah, burger flipping tools!) and Pails of Water! There are a ton of resources to manage, which may sound complicated, but through the use of tremendously well designed cards, it all comes together smoothly and at an incredibly fun pace! To start, each player is given a starting hand of cards, with one of each resource type in the game. Additionally, you get a Dog (who provides you a Shovel, appropriately) and a Peaceful Dragon (who is a filler and sometimes annoyance). Cards in Fantastiqa are simple. The upper left provides you a resource type when played. Some though, have an added benefit of having a circled icon under their provided resource, which allows for the option of choosing to play for the resource or play for the action the icon provides. This immediately separates things, and forces you to choose wisely, as sometimes the resources aren't needed in your deck, but acquiring a card with a Magic Carpet or Statue Visit Icon could help you greatly! 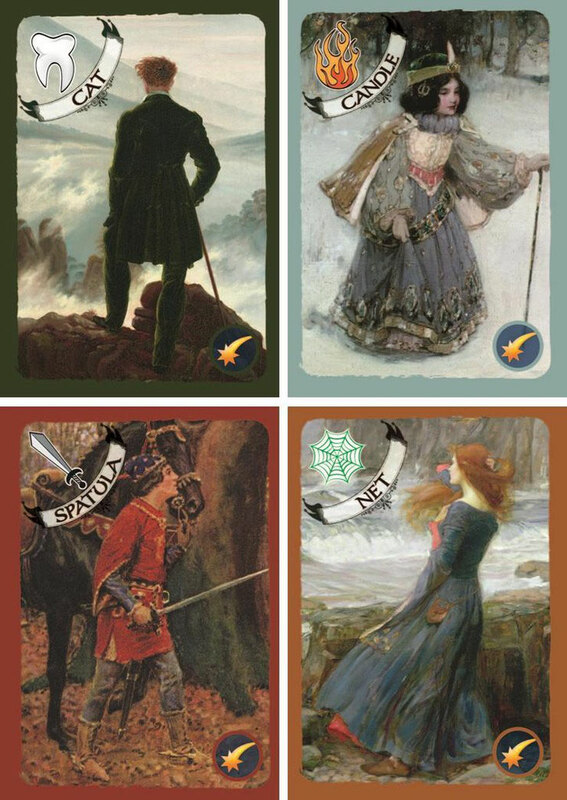 You'll acquire cards by visiting 6 different locations, all connected on a game board (orthogonally), and to travel from land to land, you'll need to play cards from your hand, that provide resources to "Subdue" (or acquire) beasts and knights found on the roads lying in between the locations. As you can imagine, yes, the locations can be randomly set up each game, so each layout can be different, but in addition, there are Statues (or Giant Meeples!) which are both superbly crafted and represent Statues at the locations that you'll visit to gain benefits. And yes, these statues, like the locations, can be placed differently each game, providing a ton of options for set up. 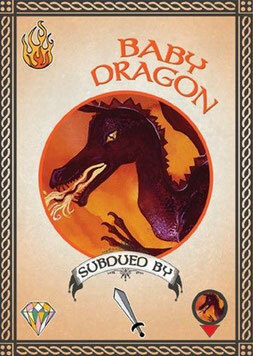 What you must know, is that the backstory to Fantastiqa is both whimsical and amazing! It reads like a movie and provides amusement and muse for the journey each adventurer is about to take. It's richly detailed, exuberantly fun, and provides a great single page set up that completely makes it plausible to be using a Spatula as a Sword or a Dirty Dishtowel as a Magic Flying Carpet! While you may be saying to yourself that all these resources sounds like a beast to manage, it really is not. 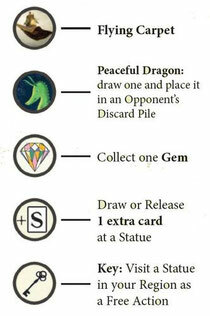 See, unlike other DBGs of the genre, Fantastiqa's win condition is based not on victory points, or filling your deck with meaningless cards at the end of the game to rack up points, but rather it uses a Quest system, that has a threshold of points you must be awarded for completing quests, that varies based on players and desired length. So, the more players and the more points you play for, the longer the game. Want a shorter game, even with 4 players? No problem. The system is highly customizable and completely flexible to provide a quick fix or a longer jaunt across the world of Fantastiqa! Complete a Quest - Use Resources to complete a quest and gain rewards. When you Go Adventuring, you simply travel from location to location by way of the roads that connect them. However, to do so, you must be able to play cards from your hand, with symbols on the upper left that match the "Subdued By:" trait of the monster or knight that is on the board, on the road, in between your travelling locations. If you can, you may travel to the next location, you acquire the monsters or knight you Subdued, and it goes into your discard pile to be used later for the resources it too provides as listed in the upper left. For example, if I wanted to Go Adventuring from one location to the next, but the Troll (pictured to the left) was on the road in between, I would have to play a card from my hand that is a Helmet (the Goat's Head) to Subdue it and acquire it and arrive at my next location. In addition, the Gem symbol on the lower left means that when I acquire him, I obtain a gem form the supply (this is a money type resource we'll talk about in a second). The Monster icon in the lower right is used during set up based on the number of players in a game and is only used in set up. Once I acquire him, when I play him from my hand, the Troll will help me and provide ma Bat resource, as listed on the upper left of his card. Now, one adventure from place to place is fun, but why stop there? When you Go Adventuring, you can continue to travel from location to location, provided you can Subdue each creature on the roads you pass through. Once you cannot, or if you choose to, you stop on the location you are at. You cannot travel via backtracking to a previously visited location, but it does provide you with an option to secure a good amount of cards. Artifacts and Beasts cost Gems, so while each player starts the game with three gems, it's advantageous to acquire the monsters like the Troll above, to get more gems. All Artifacts cost between 2 and 4 gems and all Beasts will cost 3 always. This is both good as you know what you're getting into, a bit, but challenging as when you visit these statues, you'll draw the top 3 cards, and have to choose which to buy. You may buy as many as you can afford, so sometimes it is good to save up while other times it is good to take a risk. In addition, when visiting a statue, you can choose to release cards, at the cost of gems. This means you can eliminate the cards from your deck completely, like deleting or banishing them. It'll cost though, so save those precious gems! Finally, as a third option when visiting a statue, you may spend two gems to teleport to it's twin. There are two of each statue one of each is placed on each location, so if you are in a remote corner of Fantastiqa and need to get to somewhere else, but can't seem to go adventuring or you are our of magic carpets, you can always teleport! Your final action you can take is completing a quest. First, to complete a quest, you must be in the location that is marked on the arched banner of the quest. So above, from left to right, you would need to be in the Hills, the Fields, the Hills, and the Forrest to complete each shown quest. The very top shows the rewards you will obtain when completing them. Some provide a lot of cups and some provide a lot of gems and some are in the middle. In the main text box, it shows the name of the quest, which some are an absolute blast to read out loud, and the symbols needed to complete them. While it may seem challenging to even look at something needing two webs, and think, "wow, if I have all these resources, and I need to have two webs AND be in the Hills to complete something, how am I ever going to do that?" Well fear not brave adventurer. In Fantastiqa, there is a locking system. Each player has the option to lock cards from their hand to private quests, up to the total amount of symbols needed to complete them. This means for the first quest shown on the left above, if I have it as a private quests, I can lock up to two cards under it, to pre-wire or save for when I arrive at the Hills. Smart and devious players will realize, while you can lock two webs, you are not limited to the same symbol type, so you can also lock unwanted cards to remove them from your deck for a while, if you want to risk timing and adventuring so that you'll have two webs when you arrive at the Hills and want to complete it. In addition, each player has a special Common Quest Cup token, that will allow them to lock up to 5 cards under, pertaining to the common quests. 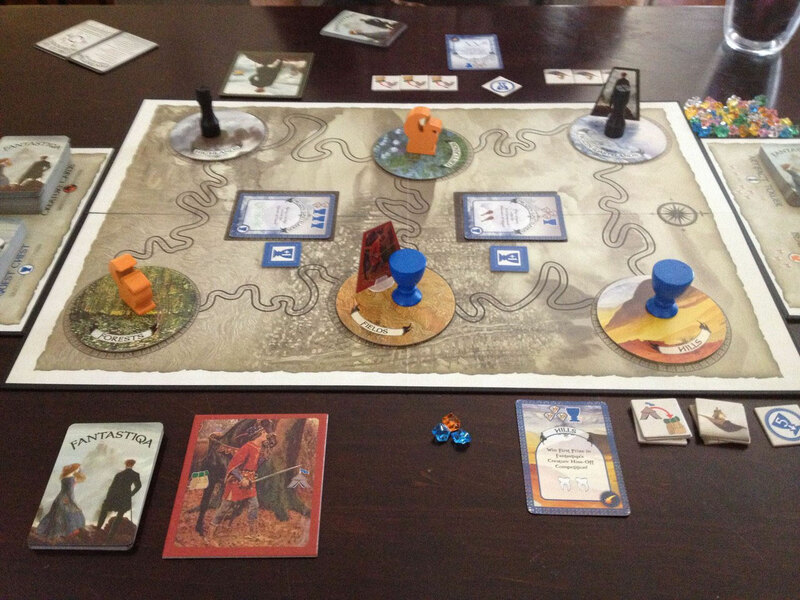 When the game begins, two common quests are placed face up on the board. While completing these means you'll have to vie with opponents, they will also each provide an additional bonus point when completing, so for example, if, of the quests shown above, the right most in the Forests is a common quest, it will provide 5 cups worth of points, instead of 4 (tokens with +1) are provided to track these as well. Questing is challenging, fun, and will test your skills in terms of deck building like never before! The cards you acquire while adventuring can additionally provide benefits. You can play them for their symbols they will provide, in the upper left, but some will have an additional icon, circled in a thick black border, that provide you a free action to take on your turn. If you choose, you can play these cards and use the action instead of the resources they provide. Flying carpets allow you to travel from location to location, just like adventuring, but doing so without having to subdue the creature on the road in between. You can only travel from adjoining locations so you can't got from the bottom left corner to the top right corner, but it offers a good option if you are stuck. Dragons, well, there be dragons here. Some cards allow you to give an opponent a Peaceful Dragon card. As mentioned, they are permanent in your deck and can't be released, so unless you lock them away in a quest plan, you're going to have them filling up your deck fast! Gems are simple. Play a card with the Gem icon in the upper left and take a gem from the supply. Note, upper left as pictured with the thick outline, not the gem icon alone on the bottom left of monsters which only denotes you get a gem when you subdue them. +S (for Statue) means you can draw or release one extra card when visiting a statue. So, if I play a card from my hand with the +S icon, and then choose to visit the Statue I'm at, I can draw 4 cards instead of 3 from the matching deck, or I can release an extra card (while still paying for it with gems). Keys are superbly fun and valuable; they let you visit a statue in the location you are at when you play them, essentially giving you two of the three possible actions on your turn, all at once. Yes, I know what you are thinking, play a key, play a +S and you can both Go Adventuring or Quest PLUS visit the statue and draw or release an extra card! Fantastiqa offers many combos like that, and that's just the surface! 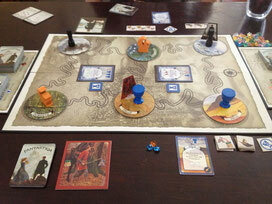 The game continues with each player taking turns, adventuring, visiting statues to improve their decks, or questing and gaining points until someone has reached the threshold of victory and has defeated their opponents. This all seems like a lot, and it is, but while your first few games of Fantastiqa may throw you out of your comfort zone, I promise if you stick with it, you'll find an amazing adventure awaits! Fantastiqa is easily the most fun and whimsical game I've played in 2013. Sure it came out last year, and yes it has some expansions, but for someone just discovering it, I assure you, you won't be disappointed. The story is filled with flare, the artwork is unique and thought provoking (like when you realize the witch is subdued by a pail of water or the troll is subdued by a helmet that looks like a billy goat) but above all else, it is fun! Fantastiqa is easily a genre breaking game. It takes all the things deck building games have molded into a set of staple rules and flips it upside down, resulting in both a grand scale adventure and yet an engaging and fun experience. Everyone we have had the pleasure of introducing this game to seems to have the same experience. At first, it's a lot to take in. After a game or two, they see the mechanics and see how things work together. Then, they start to see the combos, the strategies, and the bug bites them and they are hooked. 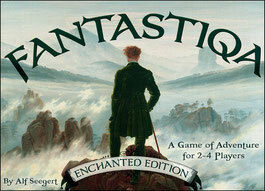 Fantastiqa is one of those games you want to play immediately again, even if you lose! Overall, there is a ton to enjoy in the land of Fantastiqa. Alf Seegert and Gryphon Games take us on an adventure we've never been on before, to a place we've never even thought of, and does it in a way that makes you want more, but doesn't leave you dissatisfied at all with what you have. All good games make you want more of it, but Fantastiqa has SO many options for strategies and plays, it'll keep you coming back multiple times to the fabled and imaginative land. Do you go heavy on one resource to complete a big quest? Do you vie for a common quest or stock up on private ones? Do you release those Helmets and Cats or will you need them later to subdue more creatures? The choices, which are superbly built in, will keep you coming back for more as Fantastiqa provides a Crit of an experience and one we’re thankful to have found to go adventuring in! Cast your vote! Fantastiqa: Crit, Hit or Miss? Fantastiqa: Crit, Hit or Miss? Just picked this game up and the production quality is insanely good. Can't wait to give the game a spin. Yes, I was very impressed with the components, storage, and overall quality. Well done. Enjoy!